Care & Safety Advice: Even when protected, avoid the mid day sun between 11 am and 3 pm and prolonged sun exposure, Keep children under 12 months out of direct sunlight. Wear protective clothing, a hat, sunglasses and use sufficient sunscreen for all unprotected areas. Over exposure to the sun is serious health threat. Directions: Apply a thick layer of Lotion on face and neck or area`s you want to apply at least 20 minutes before exposure to the sun. Re-apply again after 3 Hours for more protection if needed. 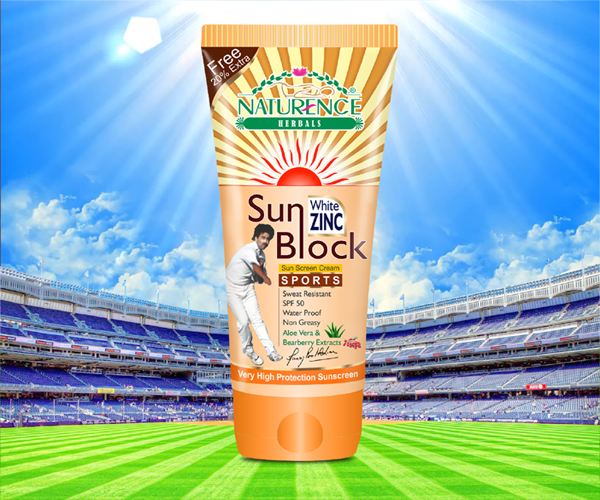 Should be used while playing cricket, swimming and other outdoor sports activities to avoid skin tanning UV rays. Warning : For external use only. Keep out of eyes. Avoid contact with fabrics. Do not use on broken, damaged and diseased skin. If a rash of irritation develops and lasts, discontinue use and contact a doctor. For sensitive skins, test product for any skin irritation on a small area of the skin prior to use. © Copyright 2015 Naturence Herbals. All rights reserved.